So, you have practiced Subbuteo basics like flicking and shooting and feel ready to face an experienced opponent? Good luck! I hope you’ve made up your mind on a reasonable defense starting formation for your team. Survival tip: Do not copy contemporary formations like Barca’s 4-4-2. Won’t do. Never. Defense subbuteo tactic: In this episode of Flicking Forever’s tactic school, I analyze how Table Football champions line up when their opponents flick off. Seven defenders, three midfielders, no attackers: I have to admit that this defense subbuteo tactic formation looks a bit destructive in the first place. But the 7-3-0 has become a classic defensive line up for most players. The three midfielders are your primary blockers. And the right and left wingers from the defense line are the secondary blockers. Source: YouTube, Channel: Serge3101, watch the complete match. In this short clip, Luca Colangelo defends in a 7-3-0 formation. And as usual for that tactic, he does not move his defenders unless it is necessary. Instead, he operates with three flexible midfield players which he shifts to the attacking side of Christophe Dheur (yellow bases). Luca Colangelo (red bases) assumes that his opponent will attack on the right wing so in advance, he places one of his midfielders (No. 11) on that side before the flick-off. Colangelo defends by flicking his midfielders (No. 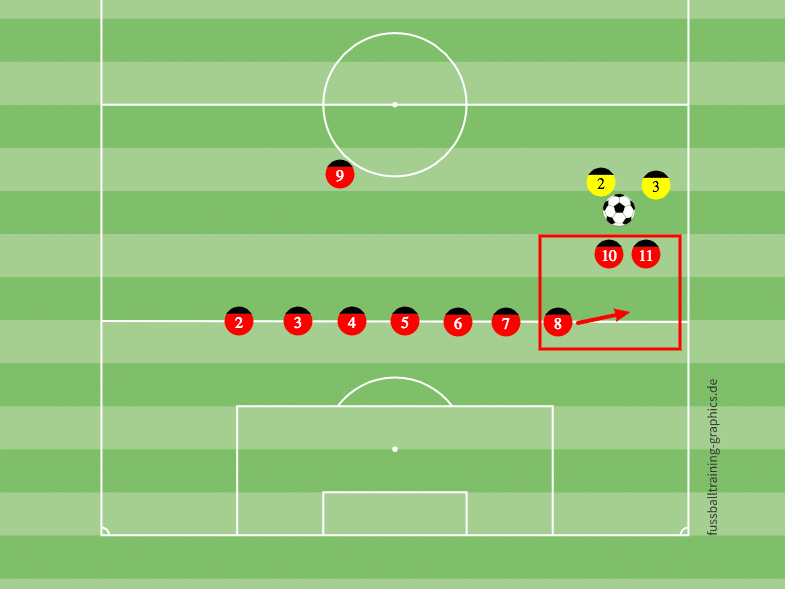 10 and 11) and involves his winger No. 8 later. But he never touches his defense line (figures No. 2 to 7) which remains an insurmountable block and forces his opponent to go wide left or wide right. If you are good, no more than three figures will be needed to stop an opponent from scoring. Colangelo creates a majority of three defenders against two attackers. No chance for a breakthrough here. Yellow has to shift his gameplay away from this blocked wing. Obviously, the 8-2-0 formation is more defensive than 7-3-0. With a tighter defense line, it will be harder for your opponent to break through the middle. But with only two flexible midfielders, you ought to be a precise flicker as your figures have to overcome longer distances. And, after a turnover, it’s challenging for you to build an intimidating attack when most of your figures hang around at the shooting line. Watch this short snippet two or three times. Have you noticed how Noguera (yellow bases) anticipates his opponent’s next flick? He already places his hand behind the next base even before Leitner (white bases) has made his flick. Any experienced player will defend like this. Maybe you (and I!) will learn anticipated defending someday. When White flicks off, a massive wall with eight yellow figures is placed on the shooting line. A wing attack is without any alternative for White. White wants to reach the white rectangle in the shooting area. Yellow shifts midfielder No. 11 to the right wing. Yellow No. 9 supports him later. With only two defenders, yellow covers the shot field (dotted yellow rectangle). White’s attack is blocked. I must confess that I love this match: Half an hour of outstanding Table Soccer action with two of the greatest players. Although it is an unbelievable comprehensive win for Carlos Flores (who raised the World Cup 2015’s trophy after this match), both players demonstrate high-end gameplay. Seven white players on the shooting line and three deep defenders behind them. That’s what I call (3/7)-0-0. If there is an existing name or you know a better one, let me know in the comments section. Red attacks on the right wing and quickly shifts to the left wing then. White flicks the three deep defenders (No. 9, 10 and 11) smoothly to where they are needed. White’s defenders (No. 2 to 8) remain on their positions at any time. And now, go back to the clip and enjoy the elegant defensive flicks from Massimiliano Nastasi again. Forget the well known Association Football tactics like 4-4-2 or 4-2-3-1. They will not work in modern Subbuteo. To withstand the attacks of more experienced opponents, it is necessary to build a strong defensive line. Period. Practice to flick your flexible midfielders to any position on both wings. They are keys to effective defending. Once your opponent gets a flick-off or a goal-flick, you can easily reposition your defense subbuteo tactic formation. 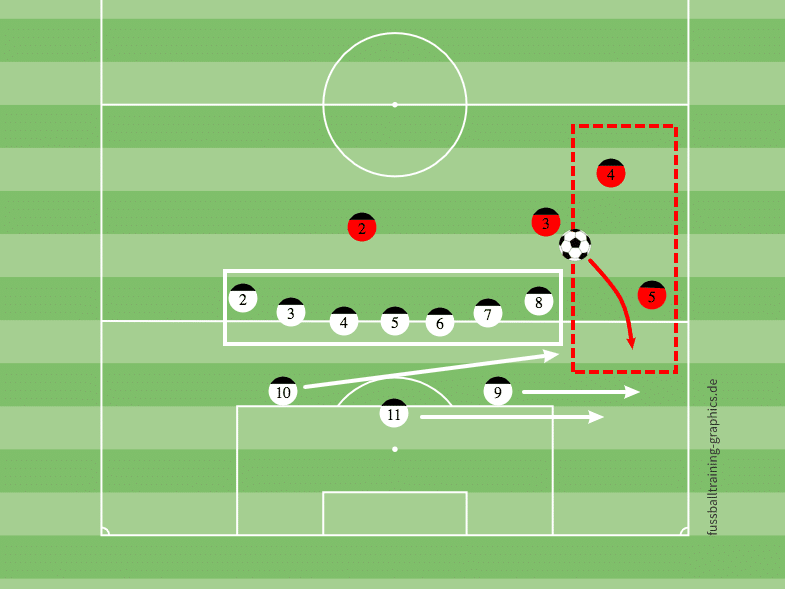 But when you lose ball possession in the running game, it is necessary to hurry up and flick your figures back to your own shooting line (see my “Difficult exercises, Backhand”). The quicker you can do, the better your defense skills will become.